Sacred Music and Liturgical Reform is a high-level study of liturgical music in the reforms of the Second Vatican Council. Anthony Ruff, a preeminent scholar of liturgical music, proposes a hermeneutic for understanding the Second Vatican Council's teachings on worship music: a balanced "inconsistency" rather than absolutist and rationalistic coherence. Ruff's focus in this study is on preservation and renewal, arising from the Council's decrees mandating, on the one hand, the preservation of the inherited treasury of sacred music (the Thesauraus Musicae Sacrae), and, on the other hand, the adaptation and expansion of this treasury to meet the changed requirements of the reformed liturgy. Sacred Music and Liturgical Reform, with an extensive index essential for any student of liturgical music, also explores controversies surrounding liturgical music and provides a historical context for the musical changes in the Church. Drawing on the musical and liturgical history that led up to and informed the statements of the Council, Ruff offers a centrist interpretation of Vatican II's teachings on worship music, an interpretation that has yet to receive any scholarly consideration, and in the process fills a gap in current analysis by seeking to reclaim and redefine the "center." This is an essential text for all professors and students of liturgical music, as well as music directors. 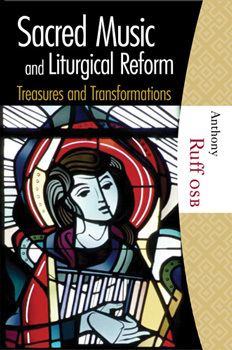 Anthony Ruff, OSB, is a member of the Music Subcommittee of the Bishop's Committee on Liturgy and has numerous articles published in Antiphon, The Hymn, and Pastoral Music, among others. Father Ruff is currently an assistant professor of theology and liturgical music at St. John's University. This title is part of the Hillenbrand Books imprint, Studies series. Hardcover, 6 x 9, 704 pages.